"Just a short note to thank you for the excellent service your company offers. I have ordered from you for many years and always with great results. It's nice to work with such a reliable organization. No one matches your supply, your prices, and the speed with which you are able to get product out the door." The FIA-approved Afterburner is a flashing rain light with a high-intensity brake light. 18 red LEDs are epoxy-potted for excellent reliability in racing conditions. Our soft annealed Copper Crush Washers are ideal for sealing brake unions. Crush washers should be used with large diameter fittings for proper sealing. Our metric Jetnuts are all-metal, self-locking nuts rated for temperatures up to 450F. The reduced hex helps in tight spaces where wrench access is difficult. 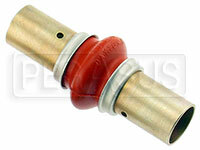 This 4" long hose coupler is designed to add a flex joint to a custom turbo or intake system. Gloss black silicone rubber with 4-ply reinforcement. 102mm nominal ID fits over 4" OD tubing. The AiM GPS08 module stores up to 50 tracks in memory for automatic lap timing with up to 5 splits per track. Also logs speed, position, and acceleration. The rechargeable MyLaps X2 car transponder (red stripe) replaces the AMB TranX 260 for auto racing in SCCA, NASA, and more. Includes a 5-year subscription. These PFC Racing Brake Pads fit the Girling 14LF caliper, used on some British Ford/Lotus, Triumph, older Formula Ford 1600, and the original Formula Mazda. The 2-piece construction of these AN929-style caps allows the JIC threaded portion to swivel independently of the 37 degree sealing portion to avoid flare damage. Flo Fast Fluid Pumps allow you to quickly and easily fuel your racecar without spilling, allowing you to transfer fluids from 55-gallon drums as well as pump fluids from 5-gallon jugs. Narrow series bearings have a narrower ball and race. Constructed using heat treated and hard chrome plated balls and hard alloy steel, PTFE lined races for unsurpassed strength and durability. Our 175 amp Auxiliary Battery Connector Set includes one handle and two connector halves (each half approximately 3.1" x 2.1" x 1"). One-way connector design prevents reverse polarity hookups. CarbonX won't char, shrink, or burn when exposed to heat and direct flame. CarbonX fibers carbonize and expand, reducing the oxygen content within the fabric. This Facet Cube Style 12 Volt Fuel Pump is for engines up to about 150 horsepower. Maximum fuel delivery 30 gallons per hour, maximum pressure 3 to 4.5 psi. Typical flow is 15 gph at 2 psi. This clear 18" filler hose for 5 gallon utility jugs has a threaded 3/4 NPT adapter to replace the center plug in your Utility Jug Cap. Backsaver Aerospace Foam Pad, 16 x 18"
The Backsaver pad was developed for combat pilots. The fluid yet firm support minimizes discomfort and fatique under grueling conditions. Medium 16x18 inch size. The Ultimate Rain Light has a cluster of 50 super-bright red LEDs for optimum visibility. Weatherproof LEDs also withstand vibration better than incandescent bulbs. The HKT 450 Hot Knife minimizes mess by slicing through foam or beads when making a custom seat insert rather than tearing it apart. Also handy for carving foam plugs for composite molding. Get the classic vintage look without breaking the bank! This economical reproduction chrome bullet mirror has a flat lens and a 2-bolt mount. Looks great on any racecar!